HIA is a rapidly growing field that positions decision makers to make better choices by bringing together scientific data, health expertise, and public input to identify the potential and often overlooked effects, both positive and negative, of proposed laws, regulations, projects, policies, and programs on public health (Health Impact Project). HIAs provide pragmatic, evidence-based recommendations about how to reduce risks, promote benefits, and monitor the health effects of the implemented decision (National Research Council 2011). HIA is a systematic, six-step process that determines the potential health effects of a proposed action, such as a plan, policy, or project. The process incorporates multiple data sources and analytic methods, and considers input from community members, residents, experts, and other stakeholders to identify potential health impacts and how those impacts might be distributed within the population (International Association for Impact Assessment 2014). The toolkit begins with background about the overlapping values between HIA and planning, and an overview of HIA generally. Next, the toolkit employs a conceptual model to demonstrate how HIA can add value to the planning process at various points in the planning process. 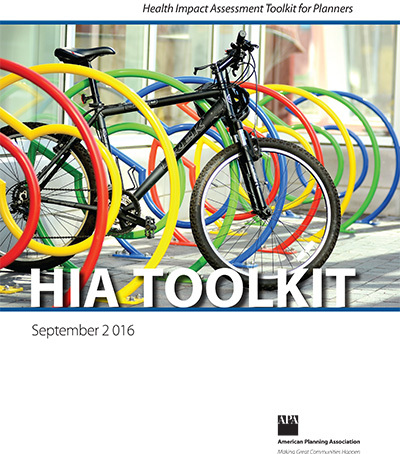 Then the toolkit provides guidance on each of the six HIA steps, focused on guiding planners through this process. Finally, the toolkit concludes with advice from HIA practitioners, ideas for other ways to integrate health into planning, and an appendix with links to resources.